We continue to see all kinds of return guests and lots of new ones as well. 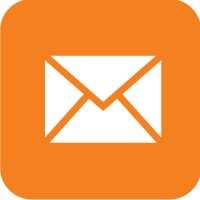 Many first time flyin fishing guests have been adjusting to the silence of the north, the great fishing, and not being anywhere near cellular service or Internet. But after day 2 or 3, most people would rather stay away from technology all together. Being in the bush resets your clock and puts your body back in tune with sunrise and sunset. It is really therapeutic for your soul just to be away from the rat race of life. Fishing has been awesome and our fishermen have been happy. Lots of sunshine, some cooler rainy weather and during the past week we have had a lot of wind which has made it more difficult on our fishermen. A normal week in the North. One night it got cold enough for some of the guests to even make a fire in the cabin to take the chill off. The fires continue to survive but are not raging during the cooler weather and the timely rains continue to help keep the fire season calm. Water levels are dropping to a normal level, maybe slightly low on some lakes which are higher on the water shed but that can change overnight after one heavy rain in our area. 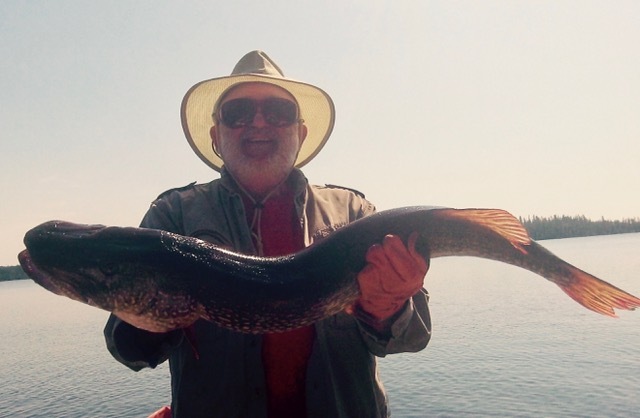 Walleyes have began to move to 10-12 feet of water and pike have gone right with them. 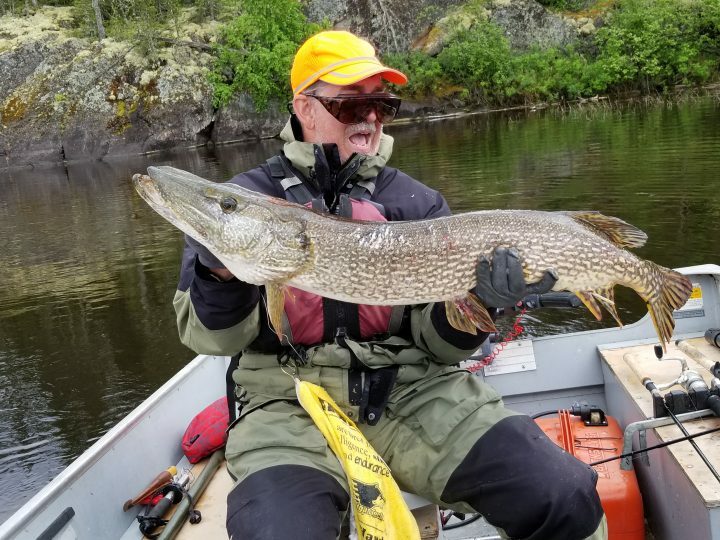 Each week there are more reports of t-boned walleyes on the way to the boat and even pike stealing walleyes right off the stringer tied to the boat! 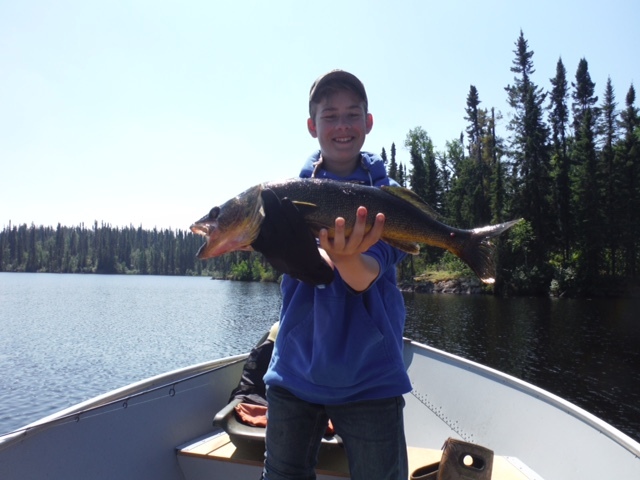 The Evans party have been fishing Vee Lake for many years and have began to bring the next generation of boys (Young Men) along. They are hooked deep. They are being taught the ways of outpost fishing some wiley veterans. Here is a preview to their upcoming feature film. The Seiler boys from PA battled the wind while they were on the Cobham. The wind was relentless but the quality was great. 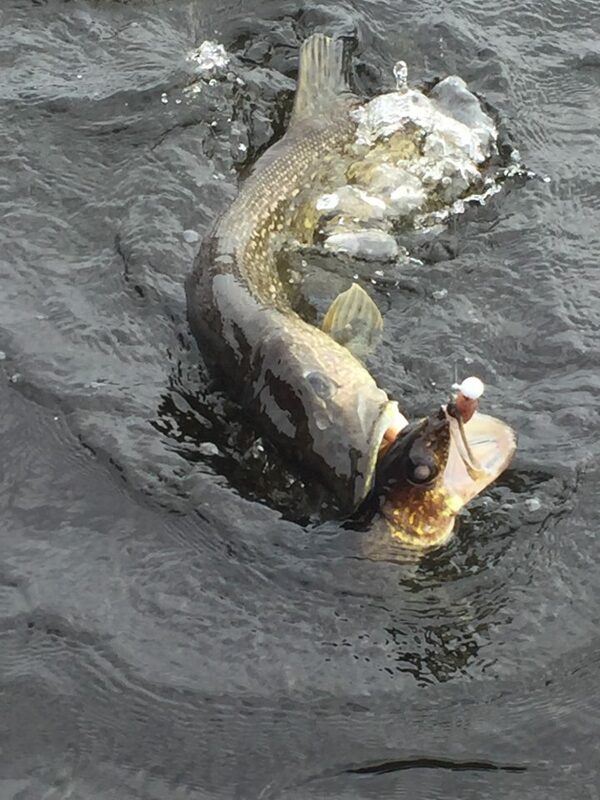 Here is a pike who was competing for dinner. The Frazer party went to Findlay lake this year and had some awesome fishing. Lots of fish and plenty of big ones! The Jansen party make their annual trip to the Cobham Morley cabin each year at the same time. They always have fun and always catch lots of fish. This year was right up near the top for quantity and quality. 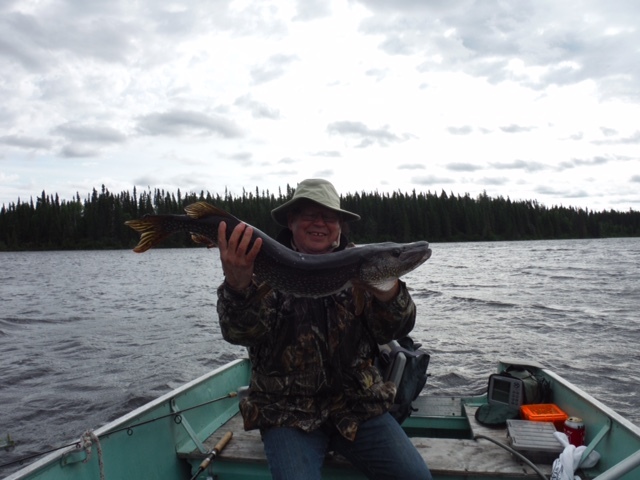 Here is John with a beautiful trophy pike.